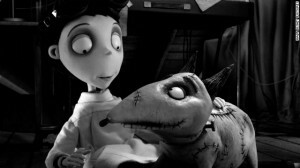 I was much impressed with Tim Burton’s remake of his own short-fil of the same title, ‘Frankenweenie’, about a boy who brings back to life his dead dog in the vein of Frankenstein. Burton really has made much of any original film in the last ten years, besides ‘Big Fish’, and in my opinion, his remakes aren’t good, but with this one, it seemed like a return from the director I grew up with and learned to love, despite my loathing of his remake films. ’Frankenweenie’ was very entertaining and a lot of fun. Burton first made this as a short film back in 1984 for Disney that had real actors and a real dog. Shelley Duvall and Daniel Stern were in the original film, and they get a special thanks a the end of the film in the credits. That short film was in black and white, as is this new clay animated version, but now it’s in 3D. The film centers around Victor Frankenstein (Charlie Tahan) and his dog Sparky. Victor doesn’t have any friends and spends his free time making low budget movies with the home video camera with his dog. Mostly monster movies. I can relate to this growing up, as I did the same thing. Victor’s parents, voiced by Catherine O’Hara and Martin Short take notice of Victor’s lack of friends, and tell him not only can he make movies and be involved in science fairs and projects, but he can play sports too. So Victor willingly plays in a baseball game where his beloved dog Sparky is hit by a car. In typical Burton fashion, Sparky is buried up on a creepy hill with a giant cement tombstone that looks over the suburban town below, which reminded me of the town in ‘Edward Scissorhands’. Victor learns from his science teacher (Martin Landau), that a small dose of electric current can animate the muscles of a dead frog, which forces the dead frog’s legs to kick up each time it’s given an dose of electricity. This gives Victor the idea of his life. He immediately digs up Sparky and just like Dr. Frankenstein lifted the monster in the rain above the ceiling, Victor raises Sparky in hopes that a bolt of lighting will hit the conductor and revive Sparky. This proves successful, and man and his best friend are reunited. However, the other kids soon find out about this and steal Victor’s equation for reanimating corpses, and in an effort to win the science fair, most of the kids in the class start to revive their own dead pets, which proves a most heinous mistake. These animals turn into monsters that attack people. There is a lot of similarities between the two films, but I could tell Burton was reaching as he tried to prolong the 30 minute short film into a feature length film. So a few of the story lines stray from the original, and prove to be more tragic to the story of the original. For instance, in the original, I really liked the fact that Victor shared with his parents right away that he reanimated their dog, whereas in the this new version, Victor tries to hide this from everyone. We all know everyone will find out, but I think Burton did this, just to make the time run longer. That being said, Burton is a mad genius when it comes to design and the look of his characters. Everything is very goth and pays homage to the old school horror films. All of the kids seem to represent one of the Universal monsters in their appearance. From their giant eyes to their twisting spines, it all feels like old school Burton. This is a good remake for Burton as he returns to his roots. I still prefer the original, but I loved all of the references in this film, and how sweet and charming the movie and characters played out. This is good for the whole family. I enjoyed it. The audio presentation is just like the video presentation…flawless. It houses a lossless DTS-HD 7.1 audio mix and just rocks the house. The dialogue is crystal clear and is never drowned out by any of the sound effects or score. There is a lot of ambient noises and sound effects here, so the rears and surrounds get used quite a bit and sounds amazing. The bass kicks in high gear with the storms and epic action sequences. The dynamics are incredible sounding too and flow smoothly. Perfect audio presentation here. Miniatures in Motion: Bringing Frankenweenie to Life (23 minutes) – This was really an amazing behind the scenes featurette, even if it was less than half an hour. Tin Burton and a few other crew members go through much of the production of the film, from the design to the style, casting, voice work, and much more. This is definitely worth checking out. ‘Frankenweenie’ Touring Exhibit (5 minutes) – This cool little feature is like a virtual art gallery tour of some of the production photos, models, sets, and stills from the movie. The amount of detail that went into this is amazing. 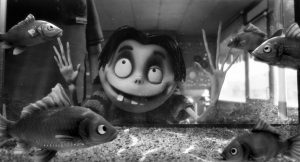 Original Live-Action Frankenweenie Short (30 minutes) – I’m so glad this is on here. 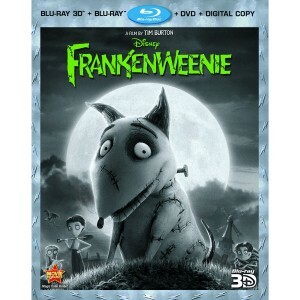 This is Burton’s original 30 minute short film of ‘Frankenweenie’, starring Daniel Stern and Shelly Duvall. I just love this. And yes kids, this was made in 1984. Captain Sparky vs. The Flying Saucers (2 minutes) – Here is one of Victor’s short films in full that he made with his lovable dog, Sparky. I only wish there were several of these. Music Video (4 minutes) – Here is a music video of the song ‘Pet Semetary’, performed by ‘The Plain White T’s. Trailers (11 minutes) – Here are trailers for the film as well as other movies from the studios. Tim Burton coming back to his first project was great. Although I really loved his live action version all from all those years ago, I really fell in love all over again with this version. It looks amazing and sounds incredible. The amount of detail in to the animation is impeccable. The extras are decent, making this gem a must own. Very high recommendation. Blu-ray Review: ‘Muppets Most Wanted’!! Blu-Ray Review: ‘Wreck It Ralph’!!! This entry was posted on Friday, January 11th, 2013 at 12:58 am	and is filed under Film, News. You can follow any responses to this entry through the RSS 2.0 feed. You can skip to the end and leave a response. Pinging is currently not allowed. « Third Man Records To Release Charley Patton, Blind Willie McTell and Mississippi Sheiks Recordings!! !